Thank you for taking a moment to explore the extensive collection of accurate and easy-to-use sample size tools available in PASS. For over 20 years, we have been fine-tuning power and sample size analyses for a broad range of statistical procedures. PASS has a variety of sample size tools for comparing means, comparing proportions, regression, survival analysis, group sequential tests, equivalence tests, non-inferiority tests, confidence intervals, normality tests, non-parametric tests and many other statistical topics. 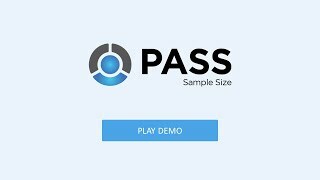 With over 200 tools, PASS is the most comprehensive sample size package on the market. And we have put a great deal of effort into finding the most accurate algorithms available. PASS has been extensively verified using published books and reference articles, and contains a validation example for every procedure. Power and sample size curves are produced seamlessly with the numeric output. The format of these plots is fully customizable. PASS comes with complete documentation that contains tutorials, examples, annotated output, references, formulas, validation, and complete instructions on each procedure. We are confident you will find PASS to be accurate, easy-to-use, and the most comprehensive sample size system available.